The Weimar Republic was a semi-presidential representative democracy that arose after World War I and ended with the rise of National Socialism (Nazism) in 1933. It was a period marked by a progressive government, increasing social liberalism, and increasing resentment by social conservatives, who blamed the Weimar government (and not the German Republic which had actually been in power) for the humiliating terms of the Versailles Treaty that had ended the war. Throughout the 1920s night clubs and bars flourished in Berlin and other German cities, and the arts, from music to cinema to music to painting to architecture, flourished. Women began to wear makeup and bob their hair and smoke in public, outraging conservatives. The government increased health insurance coverage for its citizens and instituted child abuse protections and protections for workers, including unemployment insurance. In 1933 the Weimar Republic fell with the appointment of National Socialist Adoph Hitler as Chancellor in January. Within a week a suspicious fire at the Reichstag (the equivalent of our Capitol building) allowed Hitler to cancel most of the protections granted under the 1919 Weimar Constitution. The Republic is widely considered to have ended two months later with the The Enabling Act, which allowed Hitler to bypass the Constitution and the Reichstag (parliament). We will never know what might have become of Germany’s fledgling transvestite community because the rise of Nationalism Socialism resulted in immediate and violent suppression of Jews, racial minorities, atheists, socialists, communists, intellectuals, perceived political enemies, and, yes, GLBT peoples. Members of the community fled the country, assimilated into the greater community, hid their inclinations from others, or, if male, ended up wearing upside-down pink triangles in work and concentration camps. [ii] A vibrant and growing and diverse community of artists, intellectuals, liberals, and LGBT people was swiftly and forcefully eradicated. It would be decades before trans people in Germany again began to speak out and organize. Throughout the 1990s and through the twentieth century to the present the transgender community grew. At first, like the Weimar transvestites, we told our stories to the world and to each other (and we still do)—but soon we were pressing for political change. The voices of our scholars, which had been until then been barred from academia, began to be heard, and a new field of transgender studies began to emerge. We allied with GLBT organizations, with politicians, with civil rights organizations, and with the spouses and family members who until then had rejected us. At the same time our very visibility has made us high-profile targets. The battling bathroom bills in state legislatures and city governments and conflicting stances taken by school districts around the country have lately surpassed in the news the struggles for rights by LGB people and rivaled coverage of Islamophobia and Black Lives Matter in the media. In a few years, as has happened with once-controversial gay marriage, trans bathroom issues might have been resolved and we might have adapted our movements to be more intersectional, but we will not have that opportunity, for we are now faced with a political and constitutional crisis that equals and perhaps even surpasses that of Weimar Germany. We are now facing a charismatic and authoritarian President who is dismissive of violence against minorities of all sorts;[vii] has targeted Mexicans and Arabs as undesirable and promised to deport them and build a wall along the southern border to keep them out; has threatened to imprison a political opponent; has publicly wondered why the use of nuclear weapons is unthinkable (and has proposed giving them to Japan and other countries); has mocked the disabled and antagonized a Gold Star military family, bragged about sexually assaulting women and verbally abused women on and off camera; suborned treason by urging Russia to hack American computer servers and by revealing details of top secret security briefings; earned the support and admiration of white nationalists and energized their movement; and repeatedly denied and lied about all of the above. He is now busily assembling an Executive Branch filled with fundamentalist and right-wing zealots and at least one white nationalist who have stated their intent to, among other things, bring back abusive policing practices, deport aliens, and dismantle or privatize the Affordable Health Care Act, Social Security, Medicare, and Medicaid, environmental and workplace protections, and reproductive rights. With a majority Senate and House of Representatives and a U.S. Supreme Court short one person, this administration is poised to destroy pretty much everything that has made America great. White male cisgendered heterosexual Christian American citizens have much to lose and in all likelihood will soon be suffering in a strange and un-American country. Everyone else—women, Jews, Blacks, Hispanics, Muslims, gay men and lesbians, and trans and gender nonconforming people stand to lose much more—the progress and freedoms we have fought for for more than one hundred years. The flourishing and innovative Weimar transvestite community came to a crashing end with Adolph Hitler’s rise to power. Our trans community and many other American communities face the same grave threat. Crowley, Michael. (2016, 10 August). Trump’s long dalliance with violent rhetoric. Politico. (Retrieved 22 November, 2016). Denny, Dallas. (2006). Transgender communities in the United States in the late Twentieth Century. In P. Currah, R.M. Juang, & S.P. Minter (Eds), Transgender rights, pp. 171-191. Minneapolis: University of Minnesota Press. (Retrieved 22 November, 2016). Steinmetz, Katy. (2014, 29 May). The transgender tipping point. Time Magazine. (Retrieved 22 November, 2016). Sutton, Katie. 2015, ‘Sexological Cases and the Prehistory of Transgender Identity Politics in Interwar Germany’, in Joy Damousi, Birgit Lang and Katie Sutton (ed. ), Case Studies and the Dissemination of Knowledge, Routledge Taylor & Francis Group, New York and Abingdon, pp. 85-103. (Retrieved 22 November, 2016). Weiss, Jillian T. (2014, November). The transgender tipping point: An overview for The Advocate. American Constitution Society for Law and Policy Issue Brief. (Retrieved 22 November, 2016). [*] I use the word transvestite because it was the preferred term of early XXth century German gender-variant people. I do not like the word and do not use it outside of historical contexts. 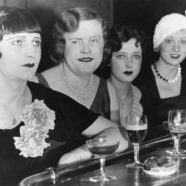 [i] As was the case in the U.S. in the second half of the century, the work of sexologists like Magnus Hirschfeld, Richard von Krafft-Ebing, and Havelock Ellis both positively and negatively impacted the fledgling Weimar transvestite community. The sexologists’ interest in case histories, combined with individuals’ needs to tell their stories, resulted in hundreds of autobiographies, fueling the rise of transvestite publications, and the sexologists provided information and assistance to many and supported the growing community—for instance, the first documented cases of male-to-female gender reassignment surgery were supervised by Hirschfeld. On the negative side, the sexologists worked within a medical model which objectified and limited the autonomy of the transvestite community. [ii] The pink triangle, usually worn right-side-up, has since become a symbol of gay pride and liberation. [iii] In the late 1970s I was turned away by the gender clinic at Nashville’s Vanderbilt University because I was not, in the view of the clinicians there, dysfunctional enough to qualify for assistance. I have written about his. [iv] Not all organizations for crossdressers subscribed to Prince’s no gays, no transsexuals philosophy, but they did not have the national visibility of Prince’s Society for the Second Self. [v] Not all crossdressers nor all transsexuals embraced this term, and some still despise it. Still, it unified the communities and led to increased visibility and eventual societal acceptance. Until now, this has been a good thing. [vi] See the website genderfork.com for an amazing display of this diversity. [vii] … and has tacitly condoned it in his public speech. Thank you so much for this piece Dallas. Much greeting from Hartford Ct. We are living in such haunting times. For years some of us have said we must as a people unify with other groups that all issues must be our issues since we are here there and everywhere. We like others who are and will be under attack from the new regime taking center stage in Jan. must form a united front and fight like hell to push back the treat of destroying us and others. For many years I have feared this day. We can yes learn from ourstories and not allow anyone to repeat this shameful piece of history. I will link from my site furbirdsqueerly to this article, which I hope is okay by you. Should I say see you at the barricades? I am nearing 70 but still have fight in me and will fight off these nasty bastards the best I can. Thanks again.